The house is perfect. I can’t imagine what else could be needed for the vacation. Pool is great (both size and depth). Surroundings with fine restaurants and trattorias. I really hope that next year I will spend here at least one week again. Regards. The house is beautiful. It was very clean and is very peaceful and comfortable with a great pool. We had a great stay at Casa Molino. The house was cool and comfortable, and the pool is perfect. The area is very quiet and peaceful, Finally, the janitor, Giancarlo, was welcoming and friendly. Thank you very much for a lovely stay. Lovely remote cottage, ideal for getting away from it all. The cottage is in beautiful and secluded surroundings, with plenty of areas to sit outside and a good sized private pool. The house is larger than we expected, with everything we needed, and excellent WiFi. Owner is very friendly and helpful. We thoroughly enjoyed our recent stay at Casa Molino, the house is spacious, well maintained and kitted out with most amenities – not having a phone signal, TV or wifi allowed us to spend time as a family playing games and chatting in the evenings so this is the place to go if you want to get away from it all. An occasional trip to the local bar for internet access was all that our teenage children needed to keep in touch with the world and not once did we hear a complaint of boredom. The house was much larger than expected, the pool was a wonderful size and was in sunshine throughout the day, it’s location just a few minutes from a small village and being within easy reach of some larger towns is just perfect as we were able to chill by the pool in between trips to various local attractions with Florence only 1.5-2 hours away. The surrounding countryside was magnificent and the locals extremely friendly, helpful and sympathetic to my (extremely) basic grasp of the Italian language. Michael was very helpful throughout the lead up to our holiday and provided excellent directions and information regarding the property, this was our first trip to Italy and certainly won’t be our last ! Our favourite local place was undoubtedly Cortona, not to be missed, along with a trip to Monte Santa Maria Tiberina for an evening meal watching the sunset in a spectacular (and surprisingly quiet) location. The hour and a half drive to Siena is also well worth the time and effort. Totally exceeded all of our expectations and helped to make this one of the best holidays we have ever had. 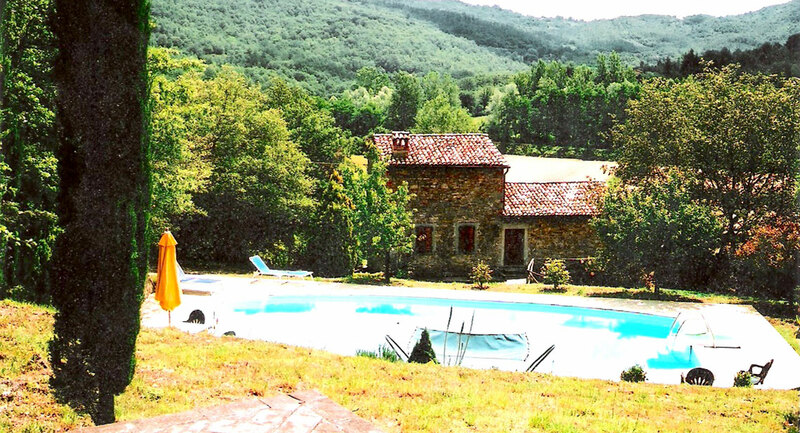 Unspoilt beautiful location, quiet, bags of character, cool and a great pool. Sunflowers everywhere. This is a lovely property that is completely detached from any noise and bustle with wonderful views of the impressive hills in which it sits. Its not cut off though and is a short drive to the friendly bar with free wifi and phone signal. Good large supermarket a 20 min drive away with smaller ‘proper independent shops’ nearer to hand. A car is a must though. The property is large and has bags of character. The original solid stonework was great for keeping the interior cool from the 36 degree heat outside. The pool was a ‘god send’ and perfect size allowing all four of us to swim with ease – and to have fun diving in and splashing around. The kitchen and shaded patio were great for evening meals and for retreat if the poolside got too hot to handle. Bedrooms are large and house could potentially accommodate more if bedding and wc/bathroom allowed. The owners were so lovely and helpful and I will definitely be recommending this property to anyone I can! My daughters one concern was (thanks to google) wildlife. (bugs, snakes, scorpions). The reality is – don’t be concerned. We saw 2 scorpions (tiny things that could easily be shooshed out the door), one small snake on the way back from the pool that shot off as soon as it saw us, and lots of tiny and very sweet lizards that copied the snake and made themselves scarce. There were wild boars in the fields next to us and we watched as they seemed to find something nice to eat amongst the crops. The farmer didn’t seem happy with them in any event. Again the closest we got was on an early morning run when one shot across the road in front of us but made off as soon as it saw us. This is the perfect get away from it all property in our view. You may travel a bit further from the airport to this house but its by far the best location for landscape, hill towns (Gubbio and Arrezo were real finds) etc without the hoards of tourists. We had a lovely two weeks. We booked the house for a relaxing honeymoon/holiday and it was perfect. Lovely quiet location with all the amenities we needed. The pool is great ( but bring plenty of insect repellent). You need a car and the drive is steep but the grounds are lovely. We took our two children with us and there was plenty if space and room for more. Michael is a pleasure to deal with and the locals are very friendly. We were even visited by some of the local dogs,who were friendly. Would definitely recommend this house. Recommended for: Families with Young Children, Romantic Getaway, Families with Teenagers. I’ve stayed at this lovely old mill house house several times over the past few years, always in the summer. It’s surrounded by agricultural land and wooded hills so is quite quiet and there are some pleasant walks nearby. The bookshelves are well stocked and there’s plenty of space in the house and garden. The drive is steep but manageable, and the E45, about thirty minutes’ drive away, makes it easy to get to Perugia and other towns in the region. The owner is a pleasure to deal with, as is Giancarlo, who visits regularly to clean and maintain the swimming pool. Altogether, it’s a delightful place to stay. Casa Molino, St Leo Bastia. Four of us stayed here for a week, myself, my wife and our two adult children. The weather was good so we spent every day bar one at the house, at the pool! The peace and quiet and privacy nestling in the wooded hills was too good. The house was refreshingly cool during the day. It was larger than we expected too, a really pleasant space to potter around. We ventured out in the evenings and found some good places to eat and shop. San Leo Bastia is friendly and both bars have wifi. Our one day out was to Citta di Castello. We stumbled on a small restaurant there which served the most delicious food. Could have spent much more time exploring the town. All in all, a week I’d gladly repeat. Recommended for: Age 55+, Romantic Getaway, Families with Teenagers.